Toronto starter Marco Estrada’s bid for a no-hitter ended in the seventh, but the Blue Jays, in front of many raucous Canadian fans, went on to win 3-2 to further bury Mariners’ playoff hopes. 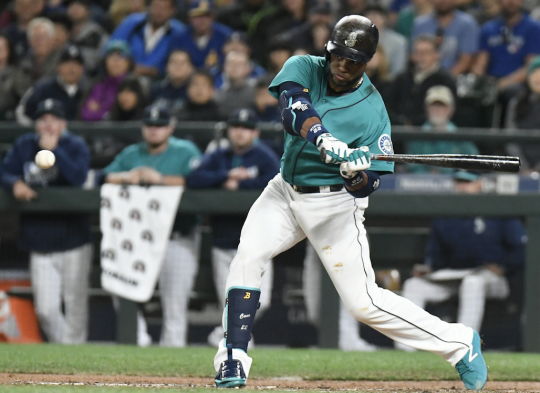 In the biggest game of the season, the Mariners couldn’t get a hit until the seventh inning and ended up falling 3-2 to the Toronto Blue Jays Monday night at Safeco Field. The loss dropped Seattle (79-71) three games behind the Blue Jays and Baltimore, the teams eading the race for the AL wild-card spots. 2B Robinson Cano broke up the no-hitter by Marco Estrada with a leadoff single in the seventh. His eighth-inning at-bat was more notable. Three walks loaded the bases with two outs and the Mariners trailing 3-0 when Toronto turned to closer Roberto Osuna, who needed seven pitches before Cano drilled a 2-2 pitch to right, only to be caught on the warning track to end that threat. Starter Taijuan Walker shook off a painful start to get through 5.1 innings, allowing three runs. In the first, Walker took a line drive off the palm of his right hand, which he used to protect himself from a 103 MPH liner off the bat of slugger Edwin Encarnacion. After a visit from trainer Rick Griffin and manager Scott Servais, Walker kept pitching and turned in another solid outing (5H 4 BB, 6 SO). His biggest mistake was a pitch Encarnacion deposited into the left-center bleachers for a 2-0 lead in the third. Drew Storen, a Toronto cast-off who was traded for Joaquin Benoit in July, took over for Walker in the sixth and entered to a chorus of boos (or was it “Drewwwwww”?) and a mocking chant of “Sto-ren . . . Sto-ren” from the many Blue Jays faithful. He promptly struck out the first two batters. Storen worked one inning, giving up a hit while striking out three, before Evan Scribner continued his scoreless streak with five consecutive outs. Estrada retired the first 11 batters . . . Two of Seattle’s three hits came with two outs in the ninth, the most dramatic of which was a CF Leonys Martin two-run homer that cut the deficit to 3-2 before Ben Gamel struck out to end the game. Cano snapped an 0-for-13 slump with his first hit of the homestand when he broke up Estrada’s no-hitter. Seattle has been shut out twice in the past four games and has scored two runs or fewer in four of its past five games. The only game upon which the Mariners really needed to focus was the one at Safeco. Toronto entered the series with a two-game lead in the AL wild-card race. The Orioles lost to Boston earlier in the day, so they fell back to a tie with the Jays for the wild card spots. Houston, which gained life during the weekend series in Seattle, is tied with the Mariners at three games behind. Detroit didn’t play and is 2.5 back.. The Royals, who are barely clinging to hope, beat the White Sox, while the Yankees were idle. The Toronto series annually brings thousands of hosers from the north. Team Canada’s fans were well-represented among the 34,089 fans, easily outnumbering the Mariners fans by a guess of about 4 to 1 . . . Blue Jays 3B Josh Donaldson was ejected in the seventh inning for arguing a called third strike . . . Toronto’s roster is stocked with ex-Mariners. Longtime Seattle starters Michael Saunders and Justin Smoak were on the Blue Jays bench Monday, while Tuesday starter J.A. Happ and veteran pitchers R.A. Dickey and Joaquin Benoit also played here. Benoit started the 2016 season with the Mariners before being traded for Storen in late July. Saunders came on to pinch-hit in the top of the ninth inning and flew out. Happ, whose Seattle career was little more than a blip on the radar, as he was traded to Pittsburgh midway through his only season with the team in 2015, was putting up Cy Young-type numbers until recently. Happ (19-4, 3.27 ERA) is looking for the first 20-win season of his career. He’s never won more than 12 games. He takes the mound at 7:10 p.m. Tuesday against Hisashi Iwakuma (16-11, 3.87 ERA). He was the Mariners’ best starter over the first 4½ months but has been spotty as of late. In 3 of the last 4 games (leaving Sunday out) the M’s scored a grand total of 3 runs in 27 innings. If it wasn’t crunch time I’d say that it doesn’t matter, that it’s just part of a long season. But it is and it does. I’ve been to M’s/Blue Jays games before and have always been amazed at the number of Blue Jays fans at the game, but last night was unbelievable. I was wearing my Mariners jacket and was getting heckled standing in the beer garden at Pyramid before the game. I even got heckled in the stadium in the main concourse area. The lower bowl area where we were sitting must have have been 85% to 90% Jays fans. How does that happen? Do all the M’s season ticket holders sell their seats to these Jays games? I don’t mind all the Jays fans there if they were up on the 300 level where they belong. I can’t imagine going any other team’s ball park and filling 80% the stadium with your fan base. It is unheard of I would think.